Governor Patrick’s hopes for Massachusetts, delivered in his state-of-the-state address in January were big-picture, visionary, limitless in their possibilities – especially in transportation, education and tax reform. They were so big, in fact, they took your breath away. His proposals focused on increasing income and gas taxes to pay for transportation improvements, more early childhood education and extended middle school hours, all the while reducing the sales tax. We were, however, left with the question of whether the Governor’s legacy was to be moving the quality of life to the next level or returning to Taxachusetts. 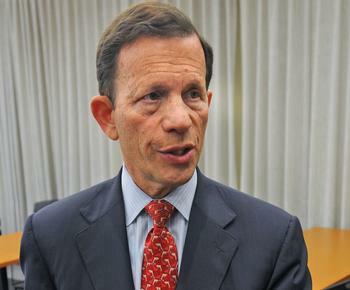 Enter elected officials like State Treasurer Steve Grossman and House Speaker Robert DeLeo. As Massachusetts Democrats, both seem to share the Governor’s values. But their practical approach is reassuring. Grossman, a probable candidate for Governor in 2014, recently gave an impressive speech to the Greater Boston Chamber of Commerce. As Treasurer, he has already found ways to save millions of dollars, especially through competitive bidding. Looking ahead, he says he’ll enter into no contract for electronic benefits transfer (EBT) that doesn’t protect taxpayers from fraud and abuse. While expressly sharing the Governor’s state-of-the-state aspirations, Grossman said one must ask whether the plan is good for taxpayers. He also warned about the negative reaction of the investor community to the plan’s inclusion of $400 million in deficit financing. Speaker DeLeo also spoke to the Chamber of Commerce. His, too, was the voice of practicality. He saw the need for some tax revenues for the transportation system, especially regional bus service, curbing MBTA fare increases, and fixing roads and bridges. Certain rail and Green Line expansions may not be financially feasible at this time. As is Grossman, DeLeo is opposed to using more debt to financing for operating expenses. Congress based its health care solution on the Massachusetts model. Would that they would do likewise in the preparation of a budget and shaping an appropriation and tax combination that would remediate problems and provide realistic answers. This entry was posted in Politics, Uncategorized and tagged Governor Deval Patrick, Greater Boston Chamber of Commerce, Speaker Robert DeLeo, State-of-the-state address. raising Massachusetts taxes, Treasurer Steve Grossman. Bookmark the permalink. Well done. You do get good info by attending the Chamber of Commerce mtgs. I don’t recall any press reports of this event.